2-room apartment 46 m2, on the lower ground floor. Living/dining room with satellite TV (flat screen). Exit to the balcony. 1 small double bedroom. Small kitchen (oven, electric coffee machine). Shower/WC. Balcony furniture. Reserved parking space n 86. Please note: non-smokers only. Resort Schwarzwaldblick. On the outskirts, 1.5 km from the centre of Schonach, in a quiet, sunny position on a slope. In the complex: storage room for skis, central heating system. Central parking spaces. 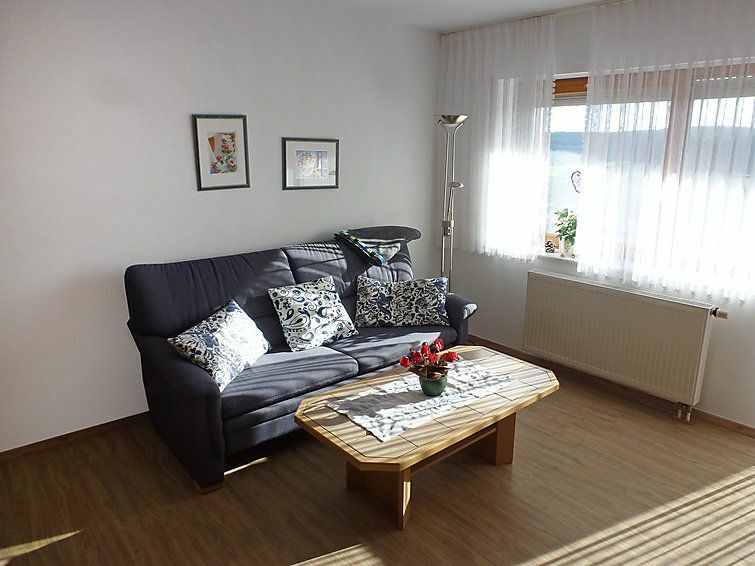 Shop 1.5 km, grocery 1 km, supermarket 2 km, restaurant 1 km, bus stop 500 m, railway station Triberg 4 km, outdoor swimming pool 6 km, indoor swimming pool 6 km, thermal baths 30 km. Tennis 600 m, riding stable 500 m, ski lift 600 m, cross country ski track 300 m. Nearby attractions: Triberger Wasserfälle 3 km. Please note: car recommended. There are more similar properties for rent in this same residence. All houses/apartments are individually designed/furnished. Natural pool 1 km. Indoor hotel swimming pool, Jacuzzi, sauna and sun luonge (all extra) 1.5 km. All holiday apartments is made in any of 4 houses apartments. The square meters of the apartments include balcony or terrace. Please note: the rental of holiday apartments is permitted only for tourism purposes. Wir waren mit unserer Ferienwohnung sehr zufrieden und hatten eine schöne Zeit! Wir haben nach einer mehrstündigen Anreise bei 35 Grad eine schöne, kleine, kühle und gepflegte Wohnung vorgefunden und uns gleich wohl gefühlt. Alles was wir für unseren 14 tägigen Aufenthalt brauchten, war vorhanden. Auf dem Balkon in der Südlage konnte man bei einem schönen Ausblick abschalten. Die Buchung, Bezahlung und die Schlüsselübergabe verliefen leicht und problemlos, was uns bestärkt, ganz bestimmt wiederzukommen!